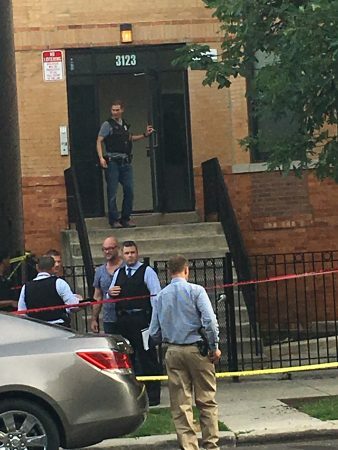 An 18-year-old black man was the victim of a shooting in the North Lawndale community of Chicago. The shooting took place at 3123 W. Douglas Blvd. at approximately 5:00 p.m. CDT, on July 6, 2016. The victim’s father was notified by the police around 5:30 p.m. Guardian Liberty Voice Videographer Untrail D. Boyd was informed that the young man was shot multiple times by the assailant. The victim, who was identified as Kewan Gillespie, and his friend were on the porch of the home when they were approached and subjected to a barrage of gunfire. 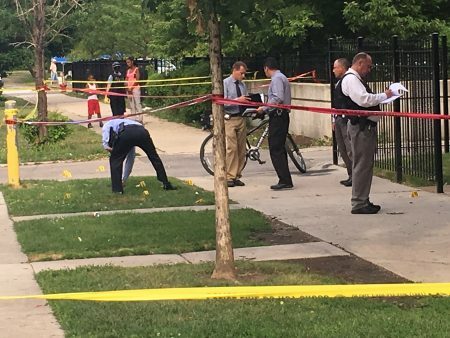 The Chicago Police Department was on the scene investigating, and they marked multiple shell casings in the grassy area just outside the fence of the home where the shooting occurred. Gillespie is from Gresham on Chicago’s South Side and was visiting with his best friend. According to his father, the innocent bystander would have been 19 years old in October. His father also stated that his son has no gang affiliation. This shooting took place west of South Albany Avenue just a few buildings down from St. Agatha’s Catholic Church. The church is the site of a summer program that is attended by Chicago youth. UPDATE: On July 8, several people from the neighborhood indicated that the victim was, in fact, affiliated with a gang. They stated that Gillespie was not an innocent bystander as previously reported. However, there has been no confirmation from the police about the victim’s gang affiliation.